Included within a Surety® Pro subscription is the ability to setup a Hail Probability Notification system for you or your clients. Every 24 hours, our system will check whether there has been any probability of hail that has occurred on or near each client’s field borders. If the system finds that there was a probability, and if that probability is greater than the assigned percentage chance, an email will automatically be sent to you, your client and/or any other contact you setup. 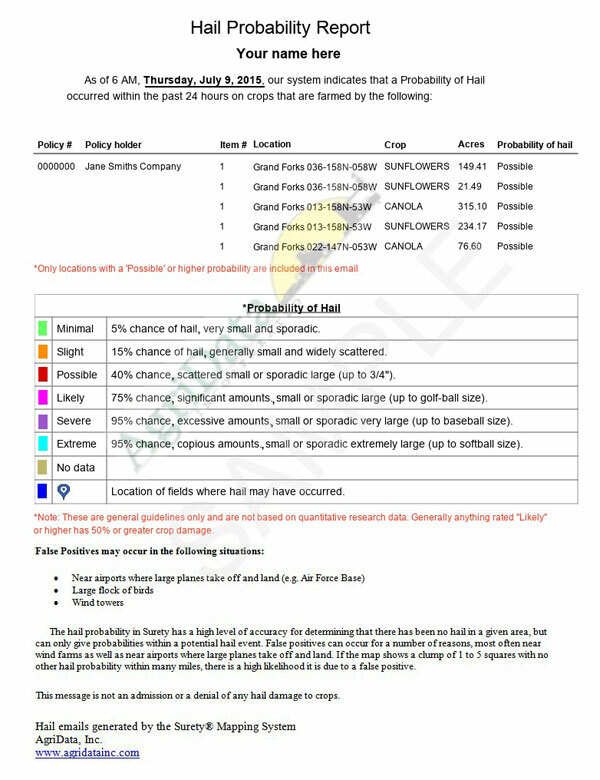 This helpful email contains an easy to understand report that contains information about the field, the hail probability severity and a convenient radar map of the area in question. This Hail Probability Notification system enables Ag businesses an additional service to offer their clientele, and helps growers know which fields need an inspection following a hail event.